Cristobal Arreola (born March 5, 1981) is an American professional boxer who has challenged three times for the WBC heavyweight title. Arreola was born in Los Angeles, California to Mexican parents. As a child he met boxer Julio César Chávez a couple of times. Arreola said of it "I had a chance to go to his house in Culiacán because my father was from near there and my aunt lived in Culiacan. I used to go and watch him train." Arreola grew up in East Los Angeles. His father was a boxer and started him boxing at the age of eight with trainer Hector Rodríguez. At 16, he had "about 200 amateur bouts" before losing interest and quitting. In 2001 at 20 he got back into boxing and after only three months of training managed to win the National Golden Gloves at the Light Heavyweight division. To win, Chris beat Dallas Vargas, who had about 300 amateur fights at the time. After another hiatus from boxing, this time for two years, he tried to come back for the 2003 Golden Gloves but arrived shortly after the check-in deadline prompting him to turn pro. In 2005 he fought Domonic Jenkins who despite his record of only 6-3 held a win over Malcolm Tann (and later KOd amateur stars Victor Bisbal and Carlos Barnett). After trailing for six rounds he turned the fight around and won by KO. In 2006 he stopped Sedreck Fields, Cuban Damian Norris (who later defeated the unbeaten Roderick Willis) and in a match of unbeaten Californian prospects Damian Wills (coming in at 22-0-0-0). In 2007 he KOd former amateur star Zakeem Graham (11-0). He was scheduled to fight undefeated Olympian Devin Vargas, brother of his amateur foe Dallas Vargas, but knocked out late sub Malcolm Tann when Vargas got injured in training, in May 2007 on ShoBox. He KO'd Thomas Hayes (record 27-0-0-0) in September 2007, in round 1. On June 21, 2008, Arreola faced fellow undefeated prospect Chazz Witherspoon (23-0) and defeated him via disqualifaction. On November 29, 2008, Arreola faced Travis Walker and knocked him out early in the 3rd round, improving Arreola's record to 26-0. By June 2008, Arreola was ranked in the top 10 by all four major governing bodies. Arreola defeated the previously retired heavyweight veteran Jameel McCline (40-8 23 KO's) on April 11, 2009, with a knockout at 2:01 of the 4th round. After his win, Arreola was the number one contender to challenge Vitali Klitschko for his WBC Heavyweight title belt. Arreola was happy with his draw when it was announced they would fight in Arreola's home town. The match took place on September 26, 2009, at the Staples Center in Los Angeles. It was broadcast on HBO. Arreola's corner and the referee stopped the fight before the start of the 11th round, giving Klitschko a 10th-round RTD (TKO) victory. The final scorecards read 99-91, 99-91, and 100–89, all for Klitschko. Soon after his first career loss, Arreola fought Brian Minto as an undercard for the Paul Williams vs. Sergio Martínez fight. Chris landed well with his straight right hand and eventually floored Minto in the 4th round; Minto got up at 8 and continued to get hit with right hands before being dropped again. The referee stopped the fight when Minto rose at 9 and appeared to be in no condition to proceed with the fight. Arreola lost his next fight, to former two-division world champion Tomasz Adamek, by majority decision on 24 April 2010. Arreola was again looking out of shape for a professional boxer at the time of the fight. Arreola in his next fight defeated Manuel Quezada in Ontario, California by a 12-round unanimous decision. Quezada was down three times in the fight: twice in the 9th round and once in the 12th. The scores (117–108) and two judges had it (118-107). Before the fight Arreola had an interview on ESPN saying that his last two defeats were because he did not train well (as well as skipping days) and stepped into the training camp weighing nearly 300 pounds. He said that he now knew how to prepare for a fight, and realizes he needs to take the training camp seriously. He came in at 256 pounds (he fought the best at 230–240, and lost his previous two weighing over 250 pounds) and fought sluggishly against a tough opponent. At the end of the fight, Arreola said he gave himself a C− for overall performance. 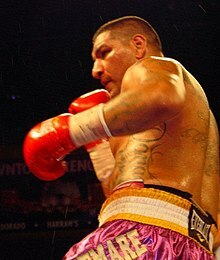 After his knockout over American Joey Abell on ESPN, Arreola took out title contender Nagy Aguilera in the third round. This bout was televised on Showtime's Andre Ward vs. Arthur Abraham undercard. Thirteen days after the fight with Aguilera, Cristobal knocked out tough veteran Kendrick Releford in the seventh round, as the main-event on ESPN. He has since then won by a 10-round unanimous decision against Friday Ahunanya on July 9, and a third-round TKO over Raphael Butler on November 5, 2011, in Guanajuato Domo De La Feria, Leon, Guanajuato, Mexico. Arreola had a chance at a rematch with Vitali Klitschko in April 2013 when he faced Bermane Stiverne. Although a favorite to win the fight, Arreola was knocked down in the third round and wound up losing a unanimous decision. On September 7, 2013, Arreola beat Seth Mitchell in a single round. After Klitschko vacated the title in December 2013, Arreola was signed to fight Bermane Stiverne for the vacant title. On May 10, 2014, Stiverne won the title after a sixth-round knockout. On March 13, 2015, Arreola made his return to the ring to face heavyweight Curtis Harper. The fight took place during the first Premier Boxing Champions on Spike TV broadcast at the Citizens Business Bank Arena in Ontario, CA. Arreola was awarded a victory by unanimous decision following 8 rounds of boxing. On July 18, 2015, Arreola fought to a ten-round draw with Fred Kassi. The scores were 96-94 for Arreola, 95-95 on the remaining two cards. Arreola's tight 12-round split decision victory over Travis Kauffman on Dec. 12 at the AT&T Center in San Antonio was changed to a no-decision on Jan. 5, after Arreola tested positive for marijuana. Arreola made his third challenge for the WBC heavyweight title when he travelled to Birmingham, Alabama on July 16, 2016 to face champion Deontay Wilder. Wilder eventually won by 8th round retirement to retain his title. 46 Win 38–5–1 (2) Jean Pierre Augustin TKO 3 (10), 2:03 Mar 16, 2019 AT&T Stadium, Arlington, Texas, U.S.
45 Win 37–5–1 (2) Maurenzo Smith RTD 6 (8), 3:00 Dec 1, 2018 Staples Center, Los Angeles, California, U.S.
42 Draw 36–4–1 (1) Fred Kassi MD 10 Jul 18, 2015 Don Haskins Center, El Paso, Texas, U.S.
41 Win 36–4 (1) Curtis Harper UD 8 Mar 13, 2015 Citizens Business Bank Arena, Ontario, California, U.S.
34 Win 32–2 Kendrick Releford TKO 7 (10), 2:43 May 27, 2011 Events Center, Reno, Nevada, U.S.
33 Win 31–2 Nagy Aguilera TKO 3 (10), 1:58 May 14, 2011 Home Depot Center, Carson, California, U.S.
32 Win 30–2 Joey Abell TKO 1 (10), 2:18 Jan 28, 2011 Pechanga Resort & Casino, Temecula, California, U.S.
29 Win 28–1 Brian Minto TKO 4 (10), 2:40 Dec 5, 2009 Boardwalk Hall, Atlantic City, New Jersey, U.S.
23 Win 23–0 Cliff Couser TKO 1 (10), 1:22 Feb 9, 2008 Pechanga Resort & Casino, Temecula, California, U.S.
21 Win 21–0 Derek Berry KO 1 (10), 0:57 Jul 14, 2007 Home Depot Center, Carson, California, U.S.
20 Win 20–0 Malcolm Tann TKO 8 (8), 1:07 May 4, 2007 Pearl Concert Theater, Paradise, Nevada, U.S.
19 Win 19–0 Zakeem Graham TKO 3 (10), 2:42 Feb 9, 2007 Suffolk County Community College, Brookhaven, New York, U.S.
18 Win 18–0 Damian Wills TKO 7 (10), 2:17 Nov 4, 2006 Mandalay Bay Events Center, Paradise, Nevada, U.S.
17 Win 17–0 Damian Norris TKO 4 (8), 2:59 Aug 19, 2006 Events Center, Reno, Nevada, U.S.
16 Win 16–0 Sedreck Fields KO 7 (8), 1:41 May 25, 2006 Pechanga Resort & Casino, Temecula, California, U.S.
15 Win 15–0 Manuel Ossie KO 1 (6), 1:33 Apr 12, 2006 Tachi Palace Hotel & Casino, Lemoore, California, U.S.
14 Win 14–0 Curtis Taylor KO 1 (6), 2:28 Mar 3, 2006 Pechanga Resort & Casino, Temecula, California, U.S.
13 Win 13–0 Domonic Jenkins TKO 5 (8), 2:38 Oct 21, 2005 Pechanga Resort & Casino, Temecula, California, U.S.
12 Win 12–0 Andrew Greeley UD 6 Sep 23, 2005 USC Lyon Center, Los Angeles, California, U.S.
11 Win 11–0 Kenny Lemos TKO 4 (4), 1:49 May 5, 2005 Spa Resort Casino, Palm Springs, California, U.S.
10 Win 10–0 Samuel Rodríguez TKO 4 (6), 1:26 Feb 17, 2005 Avalon, Hollywood, California, U.S.
8 Win 8–0 Benjamin García TKO 1 (6), 0:21 Dec 9, 2004 Pechanga Resort & Casino, Temecula, California, U.S.
7 Win 7–0 Ed Mosley TKO 1 (4), 0:59 Aug 20, 2004 Omega International, Corona, California, U.S.
6 Win 6–0 David Johnson TKO 1 (4) Apr 26, 2004 DoubleTree, Ontario, California, U.S.
5 Win 5–0 Jason Condon KO 1 (4), 2:33 Mar 22, 2004 DoubleTree, Ontario, California, U.S.
4 Win 4–0 Semisi Bloomfield TKO 1 (4), 2:40 Feb 16, 2003 DoubleTree, Ontario, California, U.S.
3 Win 3–0 David Johnson KO 2 (4), 1:21 Aug 10, 2003 DoubleTree, Ontario, California, U.S.
2 Win 2–0 Jeremiah Constant TKO 1 (4), 0:27 Oct 13, 2003 Edgewater Hotel and Casino, Laughlin, Nevada, U.S.
1 Win 1–0 Roosevelt Parker TKO 2 (4), 1:25 Sep 5, 2003 Edgewater Hotel and Casino, Laughlin, Nevada, U.S.
^ "News - Chris Arreola: A Nightmare's Dream Reborn". Max Boxing. 2010-04-24. Retrieved 2016-08-05. ^ "Wladimir Klitschko is Pretty Nervous - Vitali faces Chris Arreola". Doghouseboxing.com. 2009-09-24. Retrieved 2016-08-05. ^ "Morales: Nightmare creeping up on shot at heavyweight title". 18 June 2008. Retrieved 5 August 2016. ^ "Vitali Klitschko To Defend WBC Heavyweight Title Against Unbeaten Cristobal Arreola". BoxingInsider.com. Retrieved 2016-08-07. ^ "Cris Arreola takes out Brian Minto in thrilling affair". Sports.espn.go.com. 2009-12-06. Retrieved 2016-08-05. ^ "Boxing Notebook: Cris Arreola, Tomasz Adamek out to make history - ESPN". Espn.go.com. 2010-04-23. Retrieved 2016-08-05. ^ "Quezada-Arreola clash August 13 | Boxing News". Fightnews. 2010-07-12. Retrieved 2016-08-05. ^ "Chris Arreola Crushes Joey Abell in The First Round - Boxing News". Boxingscene.com. Retrieved 2016-08-05. ^ "Sub Lead - Arreola makes a quick return to the ring". Max Boxing. 2011-05-26. Retrieved 2016-08-05. ^ "Chris Arreola". BoxRec. 1981-03-05. Retrieved 2016-08-05. ^ "Arreola explains Don King racism allegations | Boxing News". Fightnews. 2012-02-27. Retrieved 2016-08-05. ^ "Bermane Stiverne outpoints Chris Arreola in heavyweight upset". Espn.go.com. 2013-04-27. Retrieved 2016-08-05. ^ "Cris Arreola stops Seth Mitchell in 1st round". Espn.go.com. 2013-09-08. Retrieved 2016-08-05. ^ "Bermane Stiverne drops Chris Arreola, wins heavyweight world title". Espn.go.com. 2014-05-12. Retrieved 2016-08-05. ^ "Arreola vs Harper Results & Highlights - Mar 13, 2015". Retrieved 5 August 2016. ^ "Chris Arreola's win over Travis Kauffman voided for marijuana in drug test". Espn.go.com. 2016-02-09. Retrieved 2016-08-05.